New Engine 2017 with only 20 hours. Chainplate deck plates removed inspected and resealed. All found ok. Photos can be provided at viewing. This Moody 346 fin keel cruising yacht, is a good example of the well sought after designer who designed this boat, Bill Dixon. The Moody 346 was introduced in 1986, with this particular yacht being built in 1990. The Moody 346 is a much sleeker and elegant yacht from its predecessors, yet retains its comfort and high quality feel throughout the interior boat as well. Her fin keel provides a good sailing performance with excellent sea keeping. The interior provides a comfortable living area idea for a family, with a spacious aft cabin, two more double berths and a single berth. The yacht is fully equipped with a working galley with all the necessary amenities such as a cooker and oven, as well as a shower, ideal for extended holidays.. The interior, reflects the high quality build of the boat, providing a warm and light atmosphere. The Moody 346 is a real solid cruiser. She offers pretty much all you would need in a 34' foot yacht and her layout and design are ideal for extended cruising. The central cockpit offers a safe environment and with control lines lead aft she can be managed without too many trips onto the foredeck. Below decks the standard forward cabin and main saloon is complimented by the rear cabin which (for me) offers so much when it comes to sailing with friends and family. 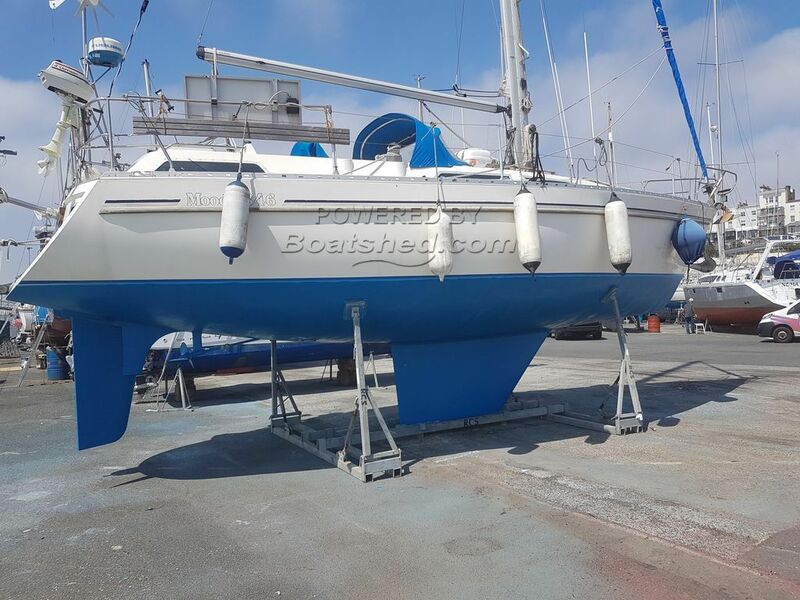 The current owner has used this boat regularly and with the new engine fitted last year with only 20 hours there are many more miles that will pass under the keel with the new owner. This Moody 346 New Engine 2017, Well Equipped has been personally photographed and viewed by Jamie nash of Boatshed Kent. Click here for contact details.